2000 members in Great Britain and Worldwide. only be kept updated if members supply details of such clubs. does not itself organise such activities. The Society is not a re-enactment Society. 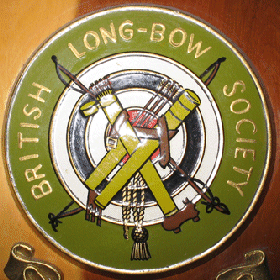 Firstly: To safeguard and perpetuate the traditions of the English recreational Longbow as shot in during and before 1951. Secondly: To provide opportunities for members to shoot in the old two-way style, at English Target and Clout rounds, in a pleasant and relaxed manner, for the Society's Awards and Medals. Thirdly: To encourage the craft and traditional skills associated with traditional bowyery and fletching. Insurance details are contained in the current Events Guide as published annually by the Society. Email the Honorary Secretary on ajbedford at hotmail.com and he will send you an application form in pdf format. in archery either through a BL-BS affiliated Club or a GNAS or NFAS Club or provide a Proposer and Seconder who are members of BL-BS and can vouch for your safety as an archer.